Eat, Drink football – literally! This quality ceramic mug displays nine little words which have entered the English consciousness and epitomises England’s World cup winning performance over Germany in 1966. This is a great novel gift for the football-mad England fan. A class 1 quality ceramic mug, boxed in a tin which features the motif “They Think it’s all over”! And as you slurp your last mouthful, three little words - “It is now” is printed on the base on the inside of the mug. If you want to make custom Tin Can Man They Think Its all Over Mug with your logo,slogan,telephone,website,email , please send us your design or give us instructions about your imprint.We'll send a free virtual art proof for your approval,you can ask a real sample with logo before production too. 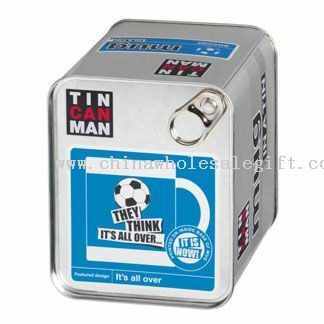 Our Tin Can Man They Think Its all Over Mug is popular as promotional,advertising, business,corporate gifts.